Kara Kennedy became teary-eyed when she accepted the Presidential Medal of Freedom on behalf of her ailing father at a 2009 White House ceremony, but she also managed to smile as Sen. Ted Kennedy's life was honored. After the senator died two weeks later following a battle with brain cancer, his only daughter read a psalm at his funeral Mass in Boston. It was about peace and justice and caring for poor children. The eldest of the senator's three children, Kara Kennedy died Friday at age 51 after collapsing following her daily workout at a Washington health club. The cause of death wasn't immediately released. Although she never sought elected office like many in her family, she helped with her father's presidential and Senate campaigns and heeded his call to give back. She worked as a filmmaker and in television and was active in an array of causes from the arts to battling fetal alcohol syndrome. She herself had been diagnosed with lung cancer in 2002, but underwent surgery the following year that doctors had said was successful. But her brother, Patrick Kennedy, said her cancer treatment — surgery and grueling chemotherapy and radiation — left her physically weakened. "Her heart gave out," said Patrick Kennedy, a former Democratic congressman from Rhode Island. In a telephone interview from her Boston home on Saturday, Joan Bennett Kennedy said she and her daughter were "best friends" who liked to take long swims together and walks on the beach. She said her daughter had fully recovered from cancer and didn't have any lingering health issues. "She was very healthy. That's why this is such a shock," Joan Kennedy said. Kara Kennedy was a member of the Sport & Health fitness center, though spokeswoman Nancy Terry declined to release further details about the incident, citing member privacy. A spokeswoman for the District of Columbia medical examiner said in an email that the cause of death was pending. Kennedy's ex-husband, Michael Allen, said she frequently visited the club and went swimming every day if she could. He said details about her death would be released by The Edward M. Kennedy Institute for the United States Senate. He said funeral arrangements are being made. "Insofar as I'm concerned her legacy is one of courage and grit and determination in the face of her own illness and in the face of many family tragedies and limitless, absolutely limitless, devotion to our children," he said. 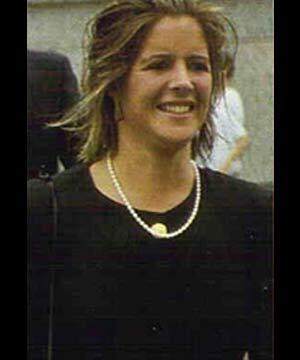 Kara Kennedy was born in 1960 to Edward and Joan Kennedy, just as her father was on the campaign trail for his brother John F. Kennedy during the presidential primaries. The late senator wrote of his oldest child in his 2009 memoir, "True Compass," that "I had never seen a more beautiful baby, nor been happier in my life." Later, she appeared with her father during his unsuccessful 1980 campaign for the Democratic presidential nomination, and she and her brother Edward Kennedy Jr. helped run the senator's 1988 re-election campaign. Her lung cancer diagnosis came in 2002, and the prognosis was grim. But the family refused to accept that, the senator wrote. She had an operation in 2003, and Edward Kennedy accompanied his daughter to chemotherapy treatments. "Kara responded to my exhortations to have faith in herself," he wrote. "Today, nearly seven years later as I write this, Kara is a healthy, vibrant, active mother of two who is flourishing." Her children, Grace and Max, are now teenagers. Kara Kennedy's two brothers have dealt with health issues of their own: Edward Kennedy Jr. lost a leg to bone cancer as a child, and Patrick Kennedy had surgery in 1988 to remove a non-cancerous tumor that was pressing against his spine. "Her magnificent strength in her successful battle with lung cancer was a quiet inspiration to all of us and provided her family and fellow patients with hope," the Edward M. Kennedy Institute said in a news release. Five months before her death, Kara Kennedy wrote of her father and the institute named in his honor in an article published in The Boston Globe Magazine. She described Christmas 1984, when her father insisted on spending the night helping relief workers feed hungry people in the Ethiopian desert. And how each summer, Ted Kennedy loaded the family into a Winnebago for road trips to hike through historic battlefields and buildings. "What mattered to my father was not the scale of an accomplishment, but that we did our share to make the world better," she wrote. "That we learned we were part of something larger than ourselves." In August 2009 Kara Kennedy accepted the Presidential Medal of Freedom, the nation's highest civilian honor, on behalf of her father. She teared up as the senator's accomplishments were read aloud. She smiled when President Barack Obama, whom Ted Kennedy had endorsed in 2008, put his arm around her shoulder in a comforting way. Kara Kennedy, a graduate of Tufts University, also helped produce several videos for Very Special Arts, an organization founded by her aunt Jean Kennedy Smith. She also served as a board member for the Edward M. Kennedy Institute; director emerita and national trustee of the John F. Kennedy Library Foundation; and as a national advisory board member for the National Organization on Fetal Alcohol Syndrome. Terry Lierman, the co-founder of NOFAS who knew Kara Kennedy for more than two decades, said she was always positive, even when she was ill, and always available when the organization needed her. "She was always there, but she was there for the cause and not for her own visibility," Lierman said Saturday. "I always found it so refreshing."